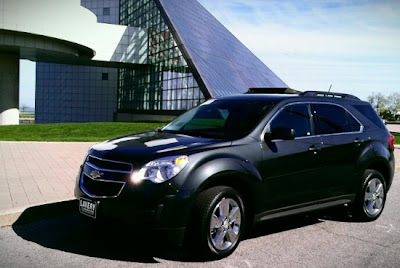 Shiny new Equinox in front of the Rock Hall. Woot. I was approached by Chevy to test drive a few of their cars for a week each and then share my opinion. My current car is a 2003 Saturn Ion 3, which is the first car that I have owned with power windows. So, I of course took Chevy up on their offer. I picked up the vehicle at Lavery Chevrolet in Alliance and was surprised to see the Equinox waiting for me. The Equinox is Chevy's stylish entry into the crossover market and with my previous comparison being my mom's Explorer, the Equinox was the winner. Sure, sure, the Equinox has a smooth, quiet ride but I loved the MyLink system most. MyLink works with your compatible smartphone and Bluetooth® wireless technology to stream content to its 7" diagonal high-resolution color-touch screen. Through voice commands or touch controls, tune into Pandora® or Stitcher SmartRadio™or listen to commercial-free programs through the three-month trial of SiriusXM Satellite Radio. 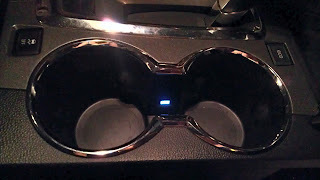 You can also connect your music-loaded flash drive or MP3 player through the USB port†. Gracenote® will even organize your music library by populating song information and album art. In other words, I loaded some tunes onto a USB drive, plugged it in and then I was treated to a little Yaz blasting through the speakers. 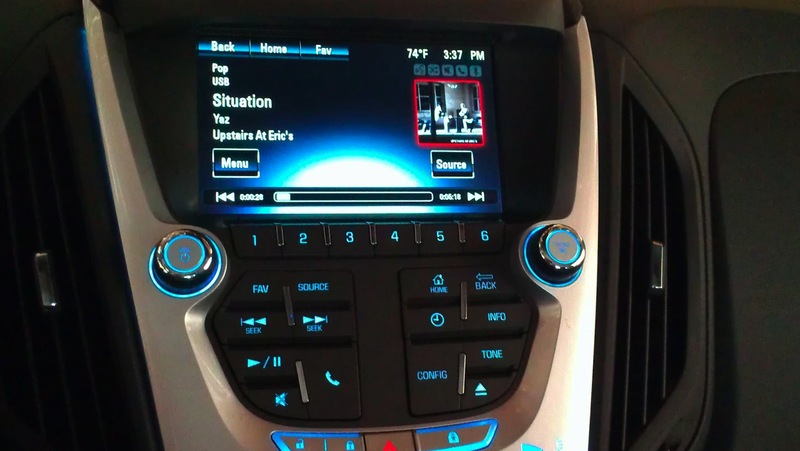 With the controls on the steering wheel, changing tunes or answering my cell was a breeze. 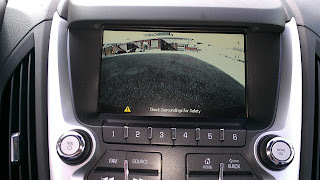 The rear view camera in action. No worries, I wasn't moving. The Equinox has a rear view camera, which I have always maintained was for lazy wusses. That was until I was parallel parking downtown for a Tribe game. With a rear view camera, you still need to look around, don't be crazy, but it made parallel parking easy in a tight spot. If you are too close there is also a warning alarm that dings at you before to crunch into something. There are lots of storage and special features in the Equinox, including eco mode to save highway gas mileage, stabilitrak for driving in slick conditions and these amazing cup holders. Not only is there a little light in them, but they also hold most size cups. If you have ever put a diet coke or a water bottle in a cup holder only to take a turn and then have it splash all over the front seat, you understand my point. To assist with blind spots, there are these great blind spot mirrors, which I greatly appreciated. The Equinox gets 32 MPG on the highway and is chock full of safety features from six airbags, 4 anti-lock brakes, Forward Collision Alert, Lane Departure Warning and OnStar. So what did I not like about the Equinox? The only thing I disliked about the Equinox was the placement of the window controls. 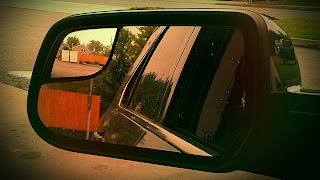 Each time I tried to roll the windows down, I hit the wrong button and rolled down the back windows instead of the front. I give the Equinox an A and it has been added to my list of options when my Saturn dies and I go car shopping. Have you driven an Equinox? Please share your opinions in the comment section. Disclosure: Chevy gave me a shiny new Equinox to drive for a week and share my opinion with you all. My words are all mine.